A recent NOAA study named 2040 as the date for the potential end of Alaskan shellfish hatcheries. That is, unless serious mitigation efforts are put in place to combat ocean acidification. The Whiskey Creek Shellfish Hatchery is located in the small town of Tillamook, Oregon. She studied biology in school, worked for an oyster company for a while, and then came on with Hanson to learn about the hatchery world. From the 1970s until 2006, there were natural ups and downs, but overall, things ran relatively smoothly. “Then all of a sudden, in about 2006, we started seeing some pretty major problems. Then from the end of 2007 to the end of 2008, we couldn’t produce larvae anymore,” says Cudd. For a year and a half, they tried to produce. Even when they did manage to get some larvae, they wouldn’t survive and develop. It was a financial nightmare for the business. They weren’t sure what to do, but they figured they should start with looking at the water. They hired an oceanographer consultant and got in touch with OSU’s marine lab. They brought in specialized equipment and began evaluating the water’s pH and other levels several times a day. Wiley Evans is a researcher at the NOAA Pacific Marine Environment Lab in Seattle. He was the project lead at Alutiiq Pride in Seward, and says what Sue Cudd is describing is now seen as a defining time in this field of research. They’ve become a model for studying and coping. Burke Hales is the namesake of the Burkolator, an instrument now used at both sites to measure partial pressure of carbon dioxide or pCO2 in the ocean. Cudd says the equipment brought in led them to find that the levels of carbon dioxide in the water were much higher than they’d expected. Lots of measurements seemed out of whack. But why had it taken them nearly two years of lost product to figure it out? And that’s her first piece of advice for hatcheries. If you haven’t already started taking measurements, start now. The Alutiiq Pride study is doing just that, says Evans. Cudd says based on daily and seasonally fluctuating CO2 and acidity levels, Whiskey Creek has developed a system to compensate. They buffer the water in their production tanks with injections of sodium carbonate. The carbonate helps organisms like clams and mussels develop their shells, which they can’t do in unusually acidic water. Alutiiq Pride is now considering that as an option for the future. 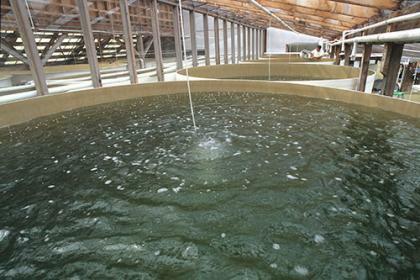 “It’s weird to think that 10 years ago, we were running this hatchery with no treatment and now we don’t ever run with no treatment,” says Cudd. And that’s been the direct cost of acidification to her hatchery. The carbonate is relatively cheap, but the whole operation has changed. They’ve had to integrate lots of expensive equipment into their daily work. Staff have to constantly monitor it, maintain it, make adjustments here and there. She asks if such a drastic change could happen over the course of a year and a half, what could happen next? “It’s incredible. It opens your eyes. It makes you see things very differently,” says Cudd. And researchers and hatcheries in Alaska are now looking to places like Whiskey Creek for clues on how to deal with the serious issue that is ocean acidification.